First, the good news: At the end of October, Susan, Katie, and I had a four day visit from two really wonderful people who came to film some preliminary footage for a possible television show. 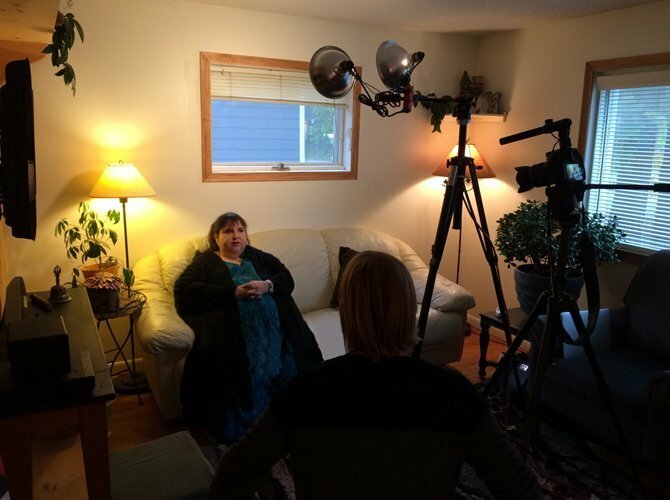 (See Susan being interviewed by Aimee in the photo above) Things are still in the early stages so there’s really not much more to report but we will be sure to update you when things progress. Second, the not so good news: Three days after our TV friends left, Susan suffered a broken humerus bone after a freak fall in the bathroom. The pain of this injury was so intense that she had to be medicated in the hospital for almost a week and then moved to a skilled care facility for pain management and rehabilitation. I’m sure it goes without saying that all progress on the book and the podcast had to stop while Susan was recovering. Fortunately, she is due to be back with us the 2nd or 3rd of December, over a month after her injury. Susan and I both want to get back to work as soon as possible so we can finish our book in early 2017. Even though she most likely won’t be ready to dive right back into work when she gets home, we should be back working together soon and that is definitely good news! My best wishes of healing go out to Susan. I look forward to you guys picking things up again. Good luck on the TV thing too that’s awesome! Oh dear. It is good to hear that Susan is alright. Get well soon!!! However, I am looking forward to the TV show. Sending my best wishes for Susan’s recovery! It is great news about the TV show!